SIMPSON BAY, St. Maarten (May 22 , 2014) - Managing Director of the Princess Juliana International Airport, SXM gave a presentation to the visiting delegation of the International Monetary Fund (IMF) on Monday, which was well received. The eight-member delegation, led by Mr. Menno Snel, Executive Director of the IMF Executive Board, had earlier been given a tour of the terminal building. The presentation included the economic impact of the airport on St. Maarten’s economy and on SXM’s hub partners as well. 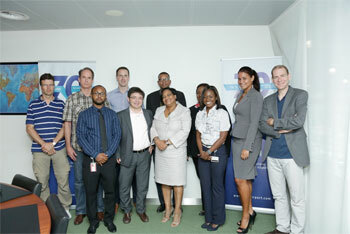 Ms. LaBega informed the IMF delegation that SXM is #1 in General Aviation in the region with The Bahamas as #2. She said SXM is building a new FBO facility to maintain its competitive advantage as other airports in the region are aggressively seeking to cut into its market share. LaBega, who was accompanied by Kalifa Hickinson, SXM’s Corporate Communications Specialist, Migdala Artsen-Clarinda, Chief of Administration, and Robert Brown, Special Projects Coordinator, informed the IMF delegation about discussions SXM has been having with Southwest Airlines to secure the service of the carrier to the destination. The IMF delegation inquired about whether SXM is looking at attracting Asian carriers to which SXM replied that it has not yet looked into this. Other areas of discussion included coordination between SXM and the Harbor Group of Companies in terms of passenger flow as well as the issue of dividends or concession fees. Similarly, the IMF delegation were informed about the Moody’s rating of Baa2 which SXM received, the bond issue and the interest rate of 5.5% secured in refinancing the old loan, which resulted in a savings of over US$10 million for the airport over the duration of the loan. Also, the Car Park project and its importance were discussed, especially since the park would offer government a new revenue stream. “We were very pleased with the meeting and the response from the delegation on the information provided,” said LaBega. For its part, the IMF delegation disclosed that they were preparing a report on their visit, which will be made public. The report will contain information garnered from their meetings on the island including the meeting with SXM.